I've been teaching ukulele for 4 years helping students develop a love for the instrument and learn more about music along the way. Ukulele is a great instrument for an introduction into stringed instruments and as a casual pastime, but when pursued seriously can be as rigorous as any other. Within the first few lessons you'll have a solid base of strumming patterns and chord changes and even a few simple songs under your belt. Moving on from there I will craft lessons to move you toward a "goal song," making sure to cater your progress to your needs while keeping a focus on good technique. I enjoy working with students of all ages and experiences and I can't wait to meet you! After a brief foray in physics, Ryan settle into a degree in music at the University of Illinois, specializing in Ethnomusicology (the study of music of different cultures). This education gave him a strong background in music theory and history in the Western tradition, but also opened him up to a vast experience of a diverse cross section of music from around the world. His insatiable love for learning new instruments started here, where he studied music from West Africa to Bali. Trained outgoing team members in performance of pieces and gave instructional presentations as part of the training staff team. Video of me playing Foggy Mountain Breakdown on banjo. 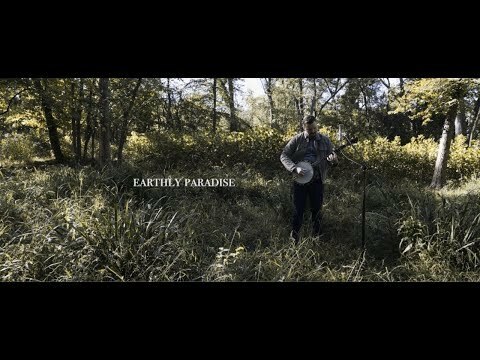 Video for an original song of mine on banjo called "Earthly Paradise"
My first lesson worked out great! Ryan is a very relaxed knowledgeable musician who takes the time to teach and listen. Ryan adapts to your speed of learning. Very important! First lesion... Ryan Doesn't rush, explains in detail, listens and answers questions. Ryan is a very good instructor. Instructor is great. On line has its problems as connectivity can be spotty. Ryan was great. I am looking forward to my next lessons. Outstanding teacher. Ryan has a gift for teaching music. He made sure that I learned clawhammer banjo the correct way and gently steered me away from bad habits. If you want to play an instrument, all you need to do is take lessons from Ryan and practice. You will succeed. It's that simple. Love that my 11 year old can take the lessons from home. He is in a car a lot of the week, so being able to not loose time over sitting in traffic yet again, is really fantastic. Love these lessons, love Ryan who is friendly, relaxed and practical. Two thumbs up. 4 weeks into banjo lessons has been great. He does a great job explaining and answering your questions. Im just a beginner but its going well. Thanks Ryan. Ryan is very flexible and accommodating. I took a banjo lesson and a mandolin lesson from him. He helped me transition easily between instruments. He also was most willing to indulge my love of Irish music. I found him to be relaxed and yet encouraging. So far so good! Instructor very knowledgeable. Felt very comfortable with the online experience. First time for me. Feel quite motivated after first lesson. Look forward to next. Thank you Ryan. I am a 60+ guy that had gotten a banjo for Christmas. I had one many, many years ago and I wanted to start again with lessons. With Take a Lesson I met up with Ryan. Here is a Kool layed back kinda guy that is a musician and a real good instructor. He has taken me from zero to cords and rolls. He listens well and is flexible enough that you learn at your own speed. Get in line for this Guy. Thanks Ryan! My first lesson with Ryan went very well. I look forward to continuing our lessons. He is very knowledgeable and friendly to work with. When Ryan accepted me as a student almost 2-1/2 years ago, he took on the daunting task of teaching both mandolin and banjo to a complete novice...who also happened to be nearly 70 years old! Ryan is a technically accomplished professional player who patiently encourages and supports his students as they find their own musical voices. He himself is a broadly cultured and serious student of musical theory, who welcomes and is happy to answer questions about why things do - or don’t! - work musically. Studying with Ryan has been a splendid experience, and an excellent investment of time and money. I come to ukelele with a mixed background of other instruments. Ryan did a great job of tailoring my first lesson to my musical skills and interests. I'm really looking forward to my weekly lessons! Eager to break down theory and provides a clear lesson plan. This was my first meeting an Banjo lesson. It was just perfect for my abilities. Homework was just great. One problem is my Web Cam is vertical not horizontal. Extremely knowledgable, nice and overall great teacher. I'm extremely happy with my first mandolin lesson and can't wait to practice what Ryan taught me and return for my next lesson. Great lesson! Ryan is patient, thoughtful, and teaches things step by step so it isn't overwhelming. Can't wait to come home from work and practice! Learn something new, good experience. Lesson 1 was Great! Ryan assessed my skills first and reviewed the foundation. He zoned in on details that I need to be mindful of when playing. He gave me homework to work on which is good. I took notes because I value his guidance and suggestions. In conclusion, Ryan is a patient and knowledgable teacher and you should take lessons with him because it is fun to learn more and hear the difference after you play it! Lesson 1 was great, Ryan is a very nice person he worked well with my 8 year old. Ryan is a very good teacher. I have been trying to learn how to play for a long time, but his techniques helped me grasp the basics quickly. He provided notes, recordings and homework after every class which helped a lot while practising and getting better at playing the ukelele. He was able to solve my doubts and issues effectively as he would imitate my play and figure out my problem areas and advise accordingly. He's very patient and consistent, it was a great experience learning with him! I really enjoy taking lessons with Ryan! He took time to really listen to and understand what my goals are and is helping me work towards them, which is no small feat for a complete beginner. He explains new concepts in ways I can understand and I feel comfortable asking for clarification if there is something I'm having trouble with. He also gives me a variety of different exercises (chords, scales, picking, strumming, full songs) to keep things interesting and to keep me engaged. I also like that he adds in a little music theory so that I know why I'm doing what I'm doing. In all Ryan is kind, chill, accommodating, talented, and thoughtful, so I would definitely recommend him as a teacher. My daughter gets along with him. He's easy going and she enjoys her lessons. Recommend! Ryan is extremely patient and helpful! Ryan did a great job getting to know my needs specifically and making sure I had the basics down before proceeding. Learned a lot in 45 minutes! My 13 year old daughter just finished her first lesson with Ryan. She was so excited to show me what she learned and said he is a great teacher and is looking forward to future lessons. She is usually a bit shy, but assured me she was comfortable with him, and my husband confirmed. So glad we found him!